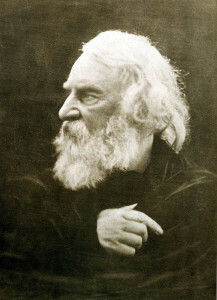 Born in Portland, Maine (at the time a part of Massachusetts), Longfellow graduated from Bowdoin College, where he read widely and began publishing verses of his own. He became a professor first at Bowdoin then at Harvard University. After the death of his wife in 1835, he began writing poetry in earnest—and in great abundance—colored by a lush romanticism. In addition to such popular lyrics as “The Village Blacksmith” (perhaps the best-known poem in American literature), he wrote American epic narratives, inspired by the long narratives of the ancient poets. The most important of these were Evangeline (1847)—the story of lovers separated when the British expelled the Acadians from Nova Scotia—and The Song of Hiawatha (1855), an evocation of an American Indian hero, inspired by the Finnish epic Kalevala.